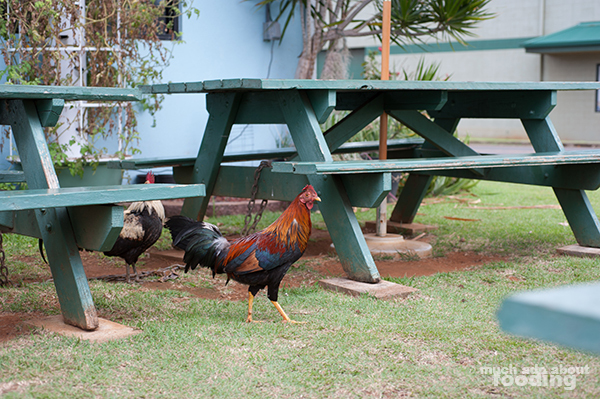 Our friend insisted that at least one time on our Hawaii trip, we must have "plate lunch," as they call it there. Our chance came when we decided to make a one day trip to Kauai and searched for places highly rated for lunch. Mark's Place came up and was a plate lunch spot so we could kill two birds with one stone. It served up the standard stuff but we were quite happy to be grabbing what we could of the local culture while we could. 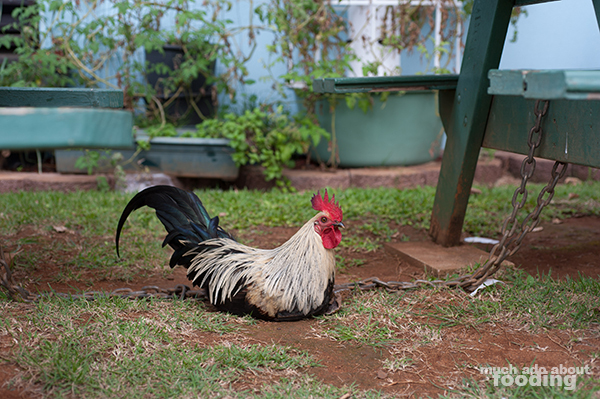 One of the first things you'd notice about the island of Kauai is that it is riddled with chickens! Duc took a few shots once we got to Mark's Place because they were all over the building and grounds when we pulled up. 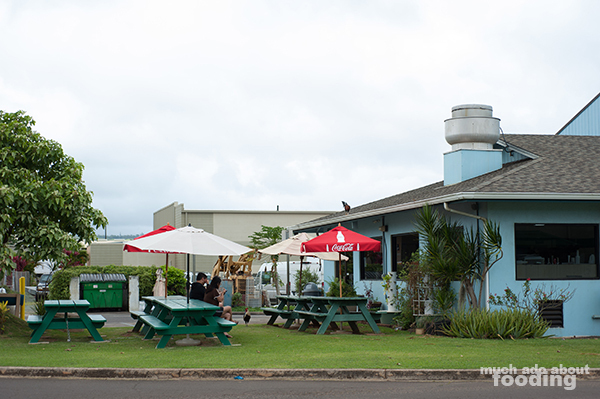 The restaurant itself is very much a casual, to-go type of joint, and its location in an industrial park zone makes the "plate lunch" style seem quite appropriate. Parking can be a pain during high traffic times, I'm sure, because the lot is small and during regular work hours, it is likely that all surrounding lots are packed as well. Lucky for us, we didn't need to worry about it then. Right when you enter, it looks very cafeteria style with a whiteboard menu above. There were shelves with small snacks to purchase as well so I can see that plenty of the industrial park company employees would drop by. The menu is simple as well - you basically choose your protein and the rest is all savvy. We were three so decided to try three different types. 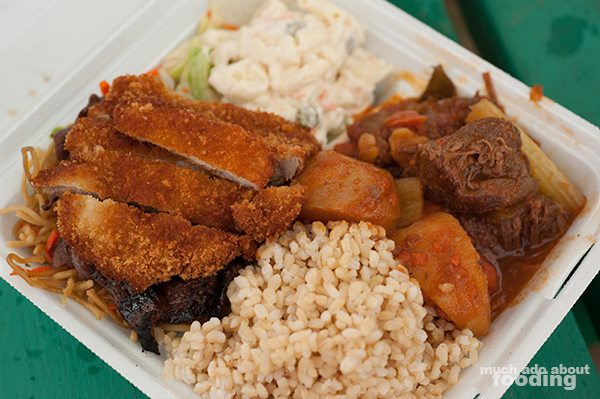 The first photo in this post is of Mark's Famous Mixed Plate ($8.95 - chicken katsu, teriyaki beef, and beef stew) with brown rice and mac salad. My first impression: this is a LOT of food! How could you eat it all in one go? The katsu was nice and crunchy though its dipping sauce was unsavory so skip that part if you'd like. The beef stew being hearty and wholesome was great for the rainy day we were there but the teriyaki beef a bit too salty for me. The mac salad was pleasant but could have used a bit more pepper for my own liking. Overall, this is a good choice if you aren't exactly sure what you'd like for your meats. The other two ordered entrees were the Korean Chicken ($8.75) and Chicken Katsu ($8.75), both at the Regular size. They have a "Mini" option that just excludes the salad but why wouldn't you want some mac salad with your meal? It's essential really. 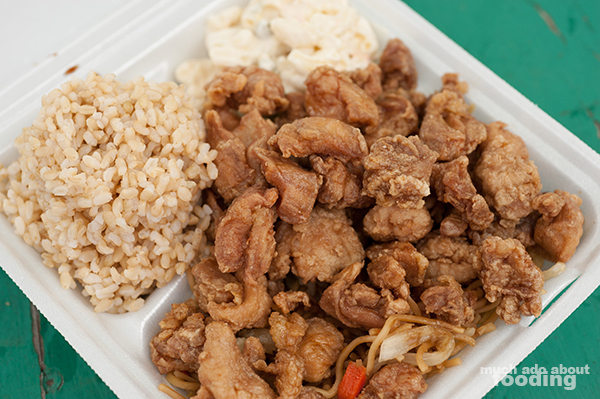 The Korean chicken was similar to popcorn chicken but less crisp. Some of the pieces were dry from what I heard though. 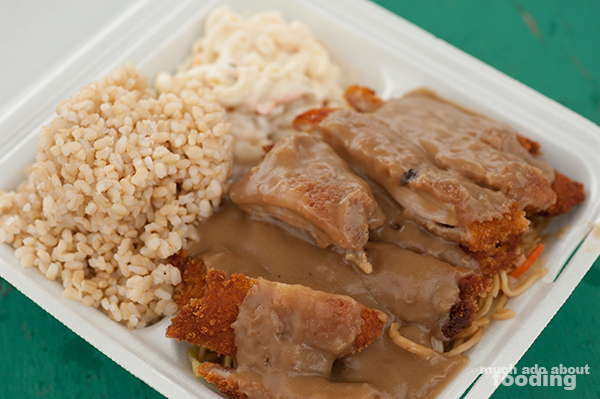 However, the chicken katsu was quite juicy even though crunchy on the outside. It was smothered in a thick, savory gravy to help as well. Overall, all portions were enormous and for some reason came with a stir-fried noodle base that was good filler (albeit greasy). Mark's Place seems like the spot to go if you want generous amounts of food and solid plate lunch. The accolades don't lie.